Webley Alecto is a multi-stroke pneumatic pistol that compresses air with minimum effort - one stroke produces muzzle velocity of 416 feet per second, two strokes 160mps and three strokes 560 ft/sec - a relief valve ensures that the gun cannot exceed the legal maximum of 5.5ft/lbs. 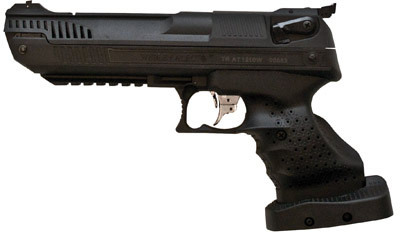 The pistol features a multiple adjustable trigger with pull strengths from 12ozs to nearly 4lbs, an adjustable grip with an ergonomic design, completely recoil free shooting, automatic safety, a rifled steel barrel, an accessories rail for mounting 'red dot' scopes or lasers, adjustable front and rear sights and is presented in a bespoke rigid ABS carrying case that includes an allen key, cleaning rod and oil. Ultimate accuracy, with maximum legal power without the cost or inconvenience of Divers Bottles or Pumps'.